Harare - Music icon Thomas Mukanya Mapfumo is reported to have sunk into debt as his ‘Peace tour’ failed to perform according to expectations. As a result Mukanya accrued a debt of over US$10 000. According to a local publication, Mukanya was evicted from his lodgings in Glen Lorne after he failed to pay US$1 500 for accommodation. “When he came from his Southerton New Year Show, doors were already locked and he was told that the case had already been reported at Borrowdale Police. He had to seek alternative accommodation in Mt Pleasant,” revealed a well-placed source. “Entertainment Republic was acting as event managers; we met with service providers and crafted arrangements acceptable to both parties. “It is unfortunate that along the way some reneged on the plans and sought to use the criminal justice system to recover their dues way before they were due. In any case he was supposed to leave the residency on January 8,” Mugaba said. 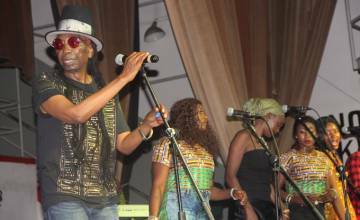 Mapfumo kicked off his Peace Tour in Gweru at the Golf Club on 10 December 2018 at an oversubscribed event. However, despite having arrived in Gweru well in time, he failed to perform because of technical glitches, leaving many of his fans there disgruntled. By midnight, the Gweru stage had no lighting and fans were in darkness. Apparently, this was because there was no cable to connect power to the stage from the main supply unit at the venue. While organisers tried in vain to solve the problem, it did not work out forcing them to abandon the event at about 1AM. In Bulawayo the following day, the organisers had hoped to make up for the Gweru event as the sound and lighting was on point.